You’re picky about your skincare and makeup, and you should be! Your skin is your biggest organ and, unfortunately, frequently the most ignored. But you’re clued in — good on you — which is why you turn to clean beauty to pamper this part of you. Lucky you, too, because it’s about to get a whole lot easier to find products with your skin in mind thanks to Sephora. Sephora might not be your number-one go-to if you’re trying to move from mainstream cosmetics to clean beauty, but they want you to reconsider. 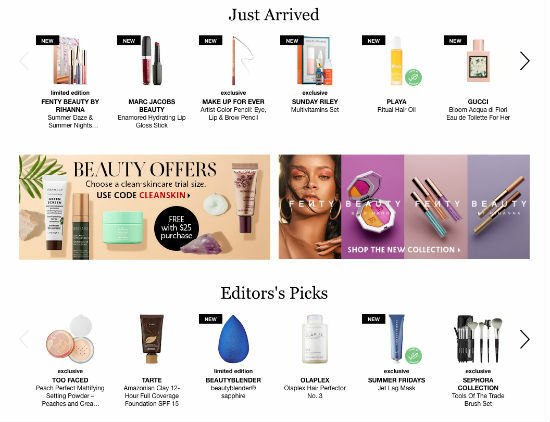 They just recently launched a clean beauty seal, called Clean at Sephora, to make it easier than ever to find your favorites or branch out into new brands. Wait, what is clean beauty? What is clean beauty, anyway? Like the sound of clean beauty but don’t know much about this new trend? Essentially it’s like the organic food of skincare and cosmetics. Just like conventionally grown fruits and veggies come with some chemicals, so too do many of the makeup brands you see in drug and cosmetic stores, like Sephora and Ulta. Brands that are considered clean beauty try not to use some of the chemical that present potential health concerns, such as parabens, sulfates and phthalates. What’s special about Clean at Sephora approved products? Maybe there are only two chemical you’re trying to eliminate from your beauty regime, maybe there are more. But when you shop using the Clean at Sephora seal as your guide, you’ll get clean beauty products that are made without coal tar, formaldehydes, formaldehyde-releasing agents, mineral oil, sulfates (SLS and SLES), parabens, phthalates, retinyl palmitate, oxybenzone, hydroquinone, triclosan and triclocarban. They even boast less than one percent of synthetic fragrances. How will the Clean at Sephora seal help me find clean beaut? And they did that on the website, too. There’s now a landing page for clean beauty products, and the green seal is easy to identify when you’re casually scrolling through the site. See a shot of the main page below where you’ll find two products that earned the Clean at Sephora seal. So stop straining your eyes reading up on chemicals and researching responsible beauty brands. Your hunt for clean beauty has never been easier. Now just cross your fingers that the free samples offered have some clean options, too.